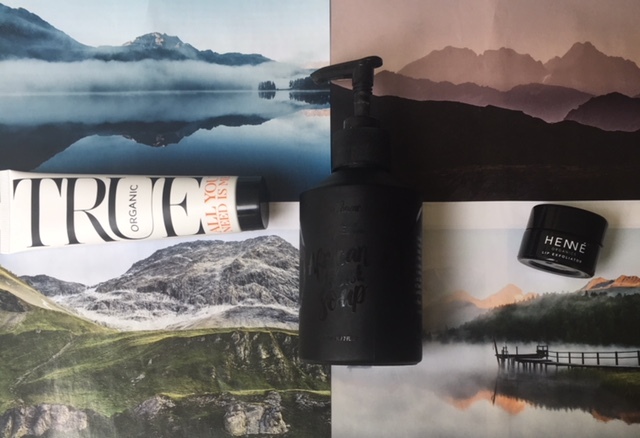 The popularity of beauty boxes, in all shapes & sizes, doesn’t seem to be subsiding, but few deliver the ‘wow’ factor that lingers in the atmosphere, as you continue trialling or using the products. One such service is provided by a Swedish-based retailer, Alice and White, which opened its doors for business in 2011. Company’s founder Lona Darouze-Kemi champions natural & organic niche skincare brands. Lona was the first retailer to offer British beauty brands Bodhi & Birch, as well as Aurelia to the Nordic customers & now sells many niche brands from around the world, some now famous, other remaining under the radar, but worthy of attention & carefully & thoughtfully curated by Lona, providing her customers with products that deliver results, as well as pleasure. Earlier this year Lona offered to send me one of her popular Botanika eco chic boxes (the information about how you can get one for yourself will be at the end of the post) & after talking to her & finding many personal & professional commonalities, I was excited to try a trio of Nordic brands, one familiar (Henne Organics), the other two (True Organic of Sweden (all you need is me) & Body Bazaar) completely new to me. Lona certainly impressed me with her knowledge, as well as the carefully curated selection of brands & products that she offers to her clients, online & in-store, in Stockholm & shipping to European countries, including UK. Well, for now at least. It certainly is a challenging time for a small independent retailer, like Alice & White, when competition comes from all sides, including Amazon & big retail chains, like Finnish Ruohonjuuri, expanding their outreach to a relatively small market in Sweden. However, Alice & White is more niche & selective with the brands they take on, while other retailers go for mass market eco brands. Life of an entrepreneur can often be overwhelming, particularly when work hours become unlimited & work takes over weekends as well, leading to late nights & mailbox overloads. Customers don’t see that, instead they expect 24/7 communication, pronto. What Lona prides herself on, is listening to customer feedback & stocking the brands that customers want, as well as those that she discovers & trusts to deliver up to high expectations. I haven’t head the pleasure yet of visiting Alice & White showroom, conveniently located in central Stockholm, but browsing the website gave me a pretty accurate idea of the type of retailer that the company is. In an ideal world Lona would love to sell brands sourced locally, but for now it remains a dream. Instead, she sets her search outreach far & wide, looking for intriguing indie brands, recently adding Tata Harper & Josh Rosebrook to her quality green beauty brand list. It is a conscious choice to represent possibly more expensive, often hand-made & artisanal ranges though, building up awareness & appreciation of that beauty segment of the market among more people. Founded in 2015 by Laura Xiao, the brand was created out of necessity really. When Laura moved from snowy Stockholm to arid Las Vegas, she ended up combining the practical knowledge & experience of living in the harsh desert & cold climate conditions. Cold & heat both produce an accumulated negative impact on your skin, particularly your lips. Being an active proponent of organic lifestyle, Laura wanted to create a balm that will sooth, soften & nurture her chronically dry lips, as at the time she couldn’t find a natural product to satisfy this need. Laura launched her brand with just one product, the now ‘cult’ Luxury Lip Balm, which contained just seven ingredients, including avocado oil, beeswax & shea butter. Now, in addition to lip balms (choose from a stick or the one encased in a pot), you can also buy lip tints (four shades) & exfoliators (choose from lavender mint, rose diamonds or nordic berries flavours). Organic sugar cane crystals are the prime ingredient in Henné Lip Exfoliators, Laura’s second beauty creation under the umbrella of her brand. Combined with coconut oil, beeswax, shea butter, Vitamin E, Jojoba seed oil, Raspberry fruit seed & Vanilla flavour, sugar crystals gently scrub away flaky skin & residual lipstick, softening the lips in the process. I have been testing Nordic Berries, which Laura said were inspired by Swedish nature. This exfoliator is as effective in colder months, as it is nurturing in warmer ones – I use it in the morning or evening, depending on my needs & the process of gentle exfoliation allows for a lovely pause, as well as naturally brings some natural colour back to the lips. Laura’s embrace of Swedish nature — as well as the country’s eco-friendly sensibility & minimalist design aesthetic — formed the foundation of the Henné lip line. Henné means “her” in Swedish. And even Laura’s product packaging reflects the “less is more” approach to life she experienced in Northern Europe. The look is timeless chic: black tubes & small jars bearing the brand’s name in simple white letters. Aesthetically pleasing on the eye, it is a welcome addition to the weekly skincare routine & while some might argue that ‘exfoliating’ dry skin on the lips can be easily done with the toothbrush (indeed it can & is effective), this product adds an element of pampering into your skincare routine. Something many of us appreciate, as the end of laborious day. P.s I have also tried recently Henne Organics lip tint in ‘intrigue’, a subtle, but flattering dark red. It moisturises the lips well & the colour is indeed flattering (it can easily double up as a cheek colour, if you need to ‘perk’ your make up on the go), but I find the rounded tip slightly impractical in terms of precision of application, as I apply it from the bullet, from inside the lips out. I have to resort to using a lip brush or finger tip to extend the colour it into the corners, making sure even coverage all over the lip line. Another tip, if you use lip balm on your lips before applying the lipstick, is to tissue off the excess before applying the lippie, making sure lips aren’t greasy & lipstick won’t ‘crease’. A tip that I learned from make-up artist Caroline Barnes & that serves my lips to perfection. Founded in Stockholm, this brand’s mission is to create effective skincare with the highest levels of organic ingredients. The company is committed to protecting the planet & its resources, and no less importantly, us humans too! Although born & raised in Sweden, brand’s founder Tina de Sousa had a successful career working around the world (USA, Thailand, New Zealand, Australia, Egypt, as well as Europe) in such diverse areas as hotel business, PR, marketing, quality control & teaching. As it happens, like many of us at some point, Tina became interested in the direct correlation between what we eat & how it affects our health & wellbeing. She studied for a degree in Science of Natural Health, returned to her homeland & got involved in the management of a health food store. All You Need Is Me was Tina’s first product & the one I got to experience, or rather my skin did. In a way this product was also inspired by motherhood, as once we go through pregnancy & childbirth & get to hold our babies in our arms, we start questioning many things we might have held dear before. Looking at tiny & fragile babies we start pondering what effect our environment, food & skincare have on them. Powered by her degree & inspired by motherhood, Tina started researching, testing & trialling & the result was a multi-tasking balm. Tina is a big proponent for recycling, so using plastic packaging wasn’t an option for her from the beginning. Luckily Swedes are ahead of the game not just when it comes to style & decor, so Tina found a Swedish company that produces sustainable tubes made out of ….sugarcane. What looks like a plastic tube is in fact produced out of material based on 100% renewable resources, including the closure – something that not many brands that work in the natural beauty field can genuinely boast about at this moment in time. 100% natural ingredients, 95% organic ingredients, no mineral oil, silicones, paragons, alcohol or water. Packaging made of sustainable paper. A handy product for your travels, be it for work or with family. I now have it in my ’emergency’ kit. My personal past experience with African black soap & Moroccan Beldi soap has been mixed. When either is used in the hammam setting on my skin by a professional, I absolutely love it. When I use it at home, in the shower, the effect is not as striking & in the past required me to clean up the bathroom or shower after the ‘pampering’ aspect was done, making me feel like Cinderella running away from the ball in her old rags. I guess that can be called pampering with a fitness aspect, but who wants to do bathroom cleaning after a long day, when body & mind are tired? Body Bazar is a small, but charming Swedish brand, with its roots deeply ingrained with social change & aimed at helping create a better future for Africa. Brand’s founder Hanan admits to ‘struggling to maintain a balance between family & running the company’, but she loves her business with the genuine passion & it is poured into each bottle. Some products are just there, others make us feel good when using them – Body Bazar African soap belongs in the latter category for me. It does have some tar undertones, but when mixed with water, it lightens up, so your attention shifts to the cleansing sensation & the lightness of your skin when you exit the shower. African Black Soap is a natural liquid soap, handmade in Ghana. It works as a gentle exfoliant on your skin & has been used for centuries in West Africa to heal scars, acne & other skin conditions. This soap works well for all skin types, including sensitive, oily, blemish prone & dry. It’s wonderfully liquid & lathers beautifully, cleansing the skin & exfoliating it – perfect if you need to shave legs or apply suntan after the shower. Body Bazar also has beautiful packaging – a matt, black bottle with glossy lettering feels reassuringly heavy in the hand and can be later used as a vase for a tiny bunch of flowers that will look stylishly pretty on your work desk or kitchen counter top. An element of recycling that feel natural, rather than forced, and leaves a lasting imprint in your memory. List of ingredients: Shea butter, Aqua (distilled water), Glycerin, Sea Salt, Carbo Medicinalis Vegetabilis (ash from cocoa pod and plantain teaf). As I mentioned earlier, Lona introduced me to this brand & product, but when I was editing this post I realised that I could no longer see the brand in Alice & White product directory. I asked Lona about it & the reply was quick, yet thoughtful – earlier this year Body Bazar decided to sell their products via their website only, because it made more sense for them economically (this is something that many indie or niche brands do, instead of being a small fish in the big ocean of beauty retailers, they choose to swim in their own beautiful aquarium). Lona helped Body Bazar build brand awareness outside Sweden & then took a step back. Something that offers you a glimpse inside the workings of the beauty industry & help get a personal feel with certain brands & retailers, something that I very much enjoy & treasure, as it informs my consumer choices, as well as the advice & knowledge I share with you online & on social media. Body Bazar products are 100% organic, vegan & handmade. BOTANIKA eco-chic box – is Alice & White’s reward gift service, custom-tailored especially for each customer. Every time You buy from A & W, you will earn your Loyalty Points: 1 SEK = 1 Loyalty Point. As soon as You reach 3000 Loyalty Points ( = 3000 SEK), you will be entitled to a Botanika eco-chic box – personally customised just for You FREE of charge! It will contain 3 full size luxury products from Alice & White’s natural organic brand selection (with total products value up to 500-1000 SEK) – a gratitude for Your loyalty & support! You don’t have to collect Your shopping history or wonder how much spent already – we got it all covered & will keep track for You. Every time Your total spending’s (starting from January 2017 & until announced further) reaches 3000 SEK, we will send Your fabulous Botanika eco-chic box together with your order. This service starts from and is valid on all purchases made with us at Alice&White (web-shop & showroom) from 1st of January 2017.